I'm thinking it's going to be a good summer. I like the people I work with. They've got me working on what seems to be a very interesting project. Moreover, it seems like everyone there is pretty cool. Some of us went out to a Jazz club tonight after work, and there are some fun sounding plans coming up in the future. Stayed in an AWESOME hotel room thanks to my friend's friend who works there. It was right in midtown manhattan and awesome. Empire State Building, where we went to the 86th floor. (That's not the tippy top, but super high). It was like an hour and a half wait and I hate heights, but it was still awesome. Hung out with Friends from high school and from college, which made it fun. Remembered how much I loved traveling. Want to make it my full time business, but at least have an excuse to attempt to make money or something. Wow, what a strange style of writing. Bah! I just got back from my first ever trip to New York City (Okay not technically, but first overnight trip). It was awesome. I had way more fun than I even expected. I thought I was over that sort of thing. Tomorrow is my first day of work, so I don't even have much time to discuss this sort of thing. But let us just say that it ruled. Feeling sleepy. Also, I practically demand that you check out this animation of the flooding of New Orleans during Katrina. It is very well done, informative and just plain interesting. Enjoy the harvest of the Internet. I'll take it as a given that you have heard of the movie/internet phenomenon known as Snakes on a Plane. What you may not know is that this movie is actually coming out and it's coming out in the very near future (Like August 18th, so pre-order your tickets immediately). 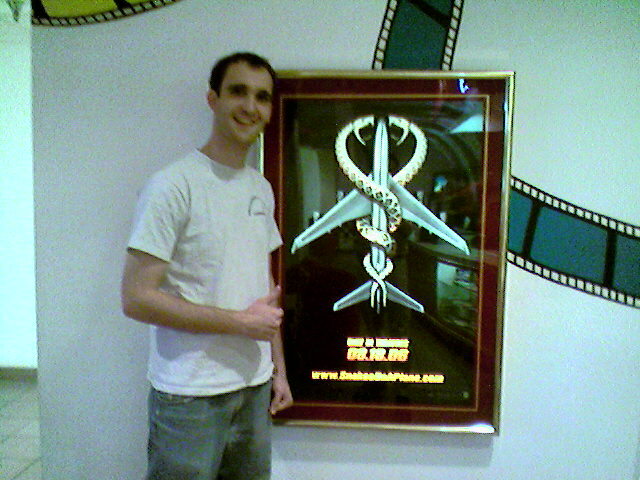 Anyways, the point is that last night I went to see Mission Impossible 3 (a not all-together bad movie actually) and it was there staring me in the face: a beautiful Snakes on a Plane movie poster. For posterity I had my friends take a picture of me next to it. Dig on the horrible cellphone quality image. The poster speaks for itself. Enjoy.